« Day 140 – Pieter A. Day 141 – Robert S.
I got another package for Anthony (Day 67) last week. This time it was from Jamie in Alabama! Take a look! Later that day I came across Robert. Robert shared with me that he had a serious drug and alcohol addiction in the past; PCP, crack, heroin, you name it. But after getting high one time and breaking into a school in PG County, he was arrested and served 12 months of an 18 month sentence. That he said cleaned him up. “I did my time and I appreciate what it did for me, but I don’t ever want to do it again” he told me. 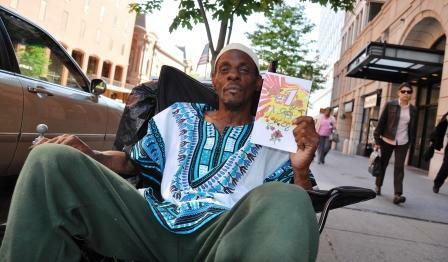 Now Robert lives with his mother and makes a living selling personalized greeting cards at the corner of 17th and H in DC. Although never married, he has five sons. You can see some of Robert’s work here. Robert is going to put the $10 toward his Metro card so that he can get to and from the corner where he sells his cards. He says he is there Monday through Friday from 7am to 7pm. If anyone knows of jobs related to drawing, Robert welcomes your help. Wow Robert is a really talented artist! His love for his mom, family, and his God is his motivation and compass, which when tuned in to, will never lead him astray! He is a blessing to so many and he will continue to move forward, doing great things for his family and others. He is proof that no matter what happens in life, you can always dust yourself off and start over again. What an inspiration and light he is in this world! Reed I’ve been telling all my friends about your blog and its been well received. Thank you for all the good it’s unveiling for the world to see. Just a thought-Robert could be a tattoo artist. He seems to have enough talent for the job. Reed, thank you so much for sharing this. How much are Robert’s cards? As an artist and an art appreciater, I would love to buy a card or two. If I send you the money, can you ask Robert to make me a card or two and have it sent to me?